What Does a Wood Planer Do? Whether you create a striking piece of furniture or prepare a rough board for finish carpentry work, beginning with a uniformly thick board prepares you for a good result. A wood planer helps you even out a piece of wood into a board with the exact same thickness everywhere. A correctly planed board is completely flat on both sides, eliminating rough spots or leftover bark. Portable handheld planers are useful for offsite applications, while stationary planers work well in woodworking shops and larger-scale operations. Hobbyist woodworkers and professionals often utilize wood planers. A handheld wood planer is portable, and older models likely are the type of planer you will have seen at an antiques show. Unlike stationary wood planers -- where you feed the wood into the planer -- a handheld requires you clamp the wood in place so you can manipulate the planer. Most handheld planers now are electric, whereas older and antique models work solely by the hand and arm pressure applied by the user. To use a stationary wood planer, place a flat board on the planer table or the work surface on which the planer sits. After taking safety precautions, turn on the planer. Begin pushing the board into the planer. Almost immediately, the planer's feed roller takes over, pulling the board through the machine. While the board travels through the planer, the rotating cutter head removes a preset amount of wood from the board. Because all planers are limited in the amount of wood they can remove at one time, you likely need to make more than one pass to acquire the board thickness you want. A skilled wood planer operator gives new life to scrap wood by shaving off unwanted grooves or protrusions. Use each modified wood piece by itself, or glue it to other planed pieces for a thicker board or block. If the glued-up boards or blocks slip while drying, and result in slightly uneven joints, use a planer to make the surface uniform again. If you plan to make cutting boards, woodcarvings or other craft items, save time by trimming the boards with a planer. A wood planer also makes short work of reclaimed wood -- often a valuable commodity for construction and furniture applications. After you remove screws or nails, use the planer to create a board with the correct thickness and appeal. Consider three variables as you evaluate different planer models. Note how easy it will be to keep the cutting blades sharpened. Some planers feature double-sided disposable knives you replace when they wear out; others have blades you must sharpen when they become dull. Also note whether a specific planer allows you to preset the thickness for multiple boards, eliminating the laborious work of manually setting your cuts for each board. Finally, a well-equipped stationary planer includes some type of dust collection system. Some manufacturers include a dust-collection hood in the planer package, while others offer the hood as an optional accessory. 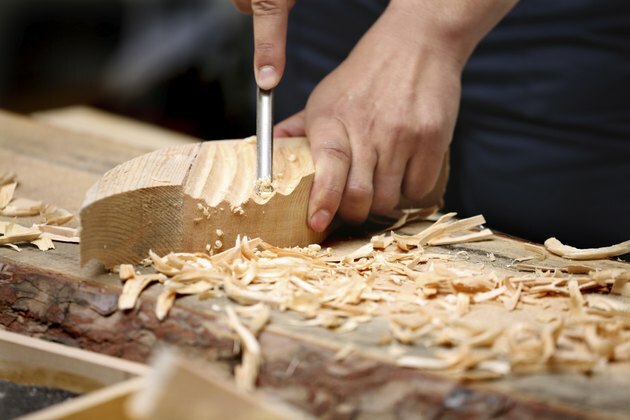 What Are the Tools & Materials Used in Handicraft & Woodworking?